Vendor bred breeder females all branded #8. Large frame, red Brahman cows that are still extremely sound in their feet & udders. Calves are from fresh to 6 mths to average about 3 mths. 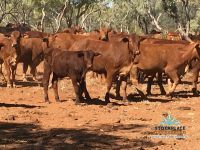 An excellent opportunity to secure high quality, vendor bred breeding females that have fantastic temprament, sound structure & years of selective breeding.